One reason for unclear water is algae blooms, which may appear as pea-green soup or filamentous mats that float to the surface of the water. Algae blooms develop when there is an excessive amount of nutrients (such as phosphate and nitrate) in the presence of sunlight. These nutrients come from tap water, rain run-off, fish waste, and debris. Establishing a self-sustaining pond ecosystem is the first order of business in controlling algae. Aerobic bacteria is your friend. It eats, digests and converts toxic biological by-products of waste into non-toxic chemicals that feed plants. The water is safer for your fish and very hospitable to plant growth. Rocks and gravel provide the perfect substrate for colonizing and growing bacteria. The more bacteria you have, the less toxic your pond water will be and the happier your plants will be. Happy plants (fed by the bacteria) compete with algae (also a plant). They remove nutrients from the water for their own nourishment, which helps to deprive those nutrients from unwanted algae - essentially starving it out. Broad-leafed floating plants such as lilies also shade the pond. Algae thrives in sunlight, so adding lots of lilies to the surface will deprive the algae of its sunlight - removing one more algae food source. Fish eat insects and, in turn, feed the plants. Mechanical filtration traps debris. Biological filtration counteracts algae-feeding nutrients. Recirculating pumps add oxygen to the water and allow gasses to escape. Oxygen feeds the fish and the bacteria which feed the plants and starve the algae. There are also some products such as Algae Blocker which tints the water and acts as a type of light filter blocking sunlight as it passes into the water depths, thus depriving the algae of one of its most important needs. If you need added algae control, consider adding a UV sterilizer to your system. Some filters come with them built in, others can have a UV sterilizer unit added on. As water passes through the intense UV light which is emitted by the sterilizer it kills micro-organisms (some harmful to fish as well) and ends algae bloom. There are also several liquid treatments to help rid your pond of algae. 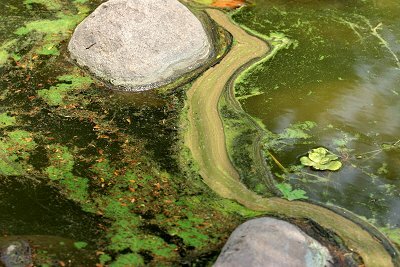 Remember that after you use an algae-controlling product you may experience large amounts of dead algae floating in and on the bottom of the pond. As this decays, it is very harmful to the fish and the pond ecosystem. If large amounts are present, it must be removed by hand (see Pond Vaccuum) and the remnants broken down quickly to prevent toxic ammonia build-up.